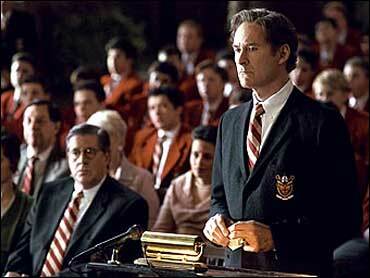 Oscar-winning actor Kevin Kline, known for both his comedic and dramatic talents, has a new movie out called the "Emperor's Club" in which he portrays a professor/assistant headmaster at an all-boys boarding school. Kline visited The Early Show on Monday to talk about the film and his upcoming plans. The St. Louis native and Priory School graduate won Tony Awards for "On the Twentieth Century" and "The Pirates of Penzance" before leading roles in "Sophie's Choice" (1982) and "The Big Chill" (1983) made him a Hollywood star. Kline won an Academy Award for his madcap performance in "A Fish Called Wanda" and received accolades for his stage interpretations of Richard III and Hamlet. Refusing to abandon his passion for theater while working in films as diverse as "Dave" and "Cry Freedom," Kline often has been called the "American Olivier." Kline has been married to Phoebe Cates since 1989 - one of Hollywood's longest lasting marriages.